NYTimes Admits "Trump Got From NATO Everything Obama Ever Asked For"
To be sure, the Times dings Trump for bruising a few EU egos (while making his Chief of Staff John Kelly cringe during a particularly blunt public excoriation of Germany), and they rebuke the President for suggesting the US might withdraw from NATO if military spending targets aren't met by member nations. At the end of the day, however, the New York Times just gave President Trump massive credit for achieving significant progress on a longstanding dispute over fairness and commitments. But alliance members leave Brussels bruised and confused. Now that the smoke has cleared from the NATO summit meeting, the most tangible result is apparent: President Trump advanced President Barack Obama’s initiative to keep the allies on track to shoulder a more equitable share of NATO’s costs. Mr. Trump even signed on to a tough statement directed at Russia. For once he saw eye to eye with his predecessor. Yet whether Mr. Trump himself is clear about the strategy he’s pursuing, or whether he in fact has one, remains as mysterious as ever. Mr. Obama persuaded NATO leaders to increase their military spending at a meeting in Wales in 2014, after a newly aggressive Russia invaded Ukraine. Back then, alliance members pledged to work toward raising spending levels to 2 percent of their gross domestic products by 2024. All 29 allies have begun to increase their military budgets in real terms, and two-thirds of them have plans to reach the 2 percent target by 2024. And they reaffirmed their “unwavering commitment” to these targets in the communiqué issued at the end of the two-day summit in Brussels this week. Of course, two days of gratuitous and self-defeating Trump bombast and threats preceded this resolution. The president publicly browbeat and insulted allies as deadbeats taking advantage of American generosity. He then raised the ante, demanding that they meet the 2 percent target — it’s a target, not some specific legal obligation — by January and then go on to raise spending to 4 percent of G.D.P. Why that much? What strategic objective, what threats to the alliance, is Mr. Trump worried about? He didn't say. Since he came into office, Mr. Trump’s urging has gotten some allies to accelerate spending increases. The response to his latest remonstrations, though, was mainly bafflement. Even after a military spending increase under President Trump, American military spending is only 3.2 percent of G.D.P. this year. What’s more, it’s expected to fall to 2.8 percent in 2024, leaving it unclear as to how even the United States would meet the 4 percent figure. As Mr. Trump, and Mr. Obama before him, have argued, Europe can do more to help itself. The allies rely too heavily on the Americans to transport troops and equipment, for instance, and the fact that France ran out of bombs during the 2011 Libya operation demonstrated a crucial weakness. There may be other shortcomings, too — NATO is not transparent with its data. Greater spending by American allies might mean the United States could lower its own spending and bring thousands of troops home. Mr. Trump didn’t make that argument, but he has often talked about withdrawing forces and closing bases, whether in Germany or Syria or somewhere else. So would the president then push for cuts in the Pentagon budget, which now stands at roughly $700 billion, more than the next eight countries in the world spend together, and use it for, say, badly needed infrastructure? Don’t bet on it. Mr. Trump has relentlessly pushed for a bigger military, seemingly mesmerized by the flashy hardware and the show of hard power that it projects. Even so, the spending metric is a narrow measure of what NATO needs to meet today’s challenges, and it may need to be discarded. One example is Denmark, which has made important contributions to alliance operations in Afghanistan and has sacrificed considerable trade with Russia because of sanctions — yet spends less than 2 percent of G.D.P., according to a study by the Center for Strategic and International Studies. Other allies could better advance their own security, and NATO’s, by spending more to solve the migration crisis and other problems that have fanned nationalism and authoritarianism, and weakened democratic institutions, especially in Turkey, Hungary and Poland. This trend, encouraged insidiously by Russia, may be the biggest threat, eroding the alliance from within. 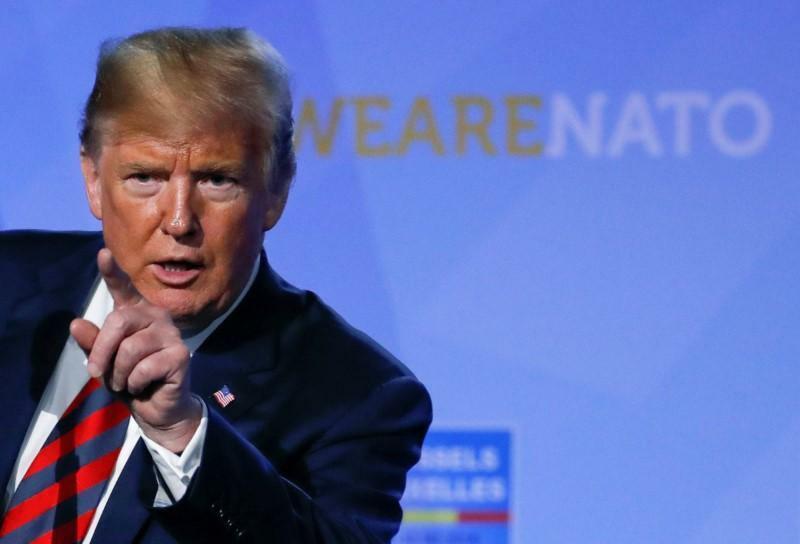 Such sensible discussions weren’t possible in Brussels, as allies were left instead with angst over Mr. Trump’s hint that he may withdraw from NATO if the military spending targets are not met. He said on Thursday that he could probably withdraw from NATO on his own authority. This threat seems more in line with Mr. Trump’s broader interests. He has made clear that Russia’s attack on Ukraine and seizure of Crimea are of little matter to him. He’s spoken more warmly of President Vladimir Putin than of any ally, even disputing the Russian leader’s role in undermining the 2016 election. For these reasons, it’s imperative that Congress, which has abdicated to Mr. Trump on many crucial issues, pass immediately legislation prohibiting him from leaving NATO unilaterally. The Senate had to ratify the treaty when America created NATO, and it should block any move to destroy the alliance that has been an anchor of trans-Atlantic stability over seven decades.